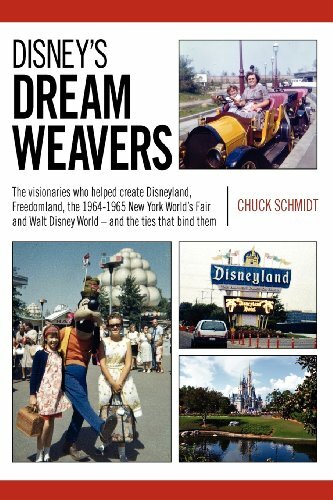 Disney's Dream Weavers isn't the first book dealing with the expansive world of Disney nor will it be the last. But it is the first book to explore the common thread that winds its way through four very different, yet distinctly connected amusement enterprises - Disneyland in California, the world's first theme park; Freedomland, a short-lived park in New York City in the early 1960s created by Disney outcast C.V. Wood; the 1964-1965 New York World's Fair in Queens, N.Y., which saw the introduction of Disney's cutting-edge Audio- Animatronics technology, and Walt Disney World in Florida, Walt Disney's noble attempt to right the wrongs of America's urban landscape. That common thread starts with the creation of Disneyland in Anaheim, Calif., in 1955 and includes C.V. Wood, the park's general manager, who was a key player in bringing Walt Disney's decades-long dream to life. But after Wood left Disney's employ under acrimonious circumstances just a year later, he attempted to imitate his former mentor in grand style by building several parks of his own, including Freedomland, a United States history-themed park in the Bronx. Chuck Schmidt is an award-winning journalist who began his newspaper career as a copy boy in 1967 for the Staten Island Advance in New York City. He quickly moved up the ranks, first as a part-time sports reporter, then as an assistant sports copy editor and then as Night Sports Editor. Since 1984, he has been the newspaper's Sunday News and Travel Editor. Chuck has covered several major Disney events, including Walt Disney World's 15th and 25th anniversaries, the grand opening of Disney's Animal Kingdom Park in 1998 and the christenings of the Disney Cruise Line's Dream (2011) and Fantasy (2012) ocean liners. Since 2009, Chuck has shared his love and knowledge of all things Disney in his Goofy about Disney blog on www.SILive.com. He resides in Freehold, N.J., with his wife Janet. They have three grown children and three grandchildren.